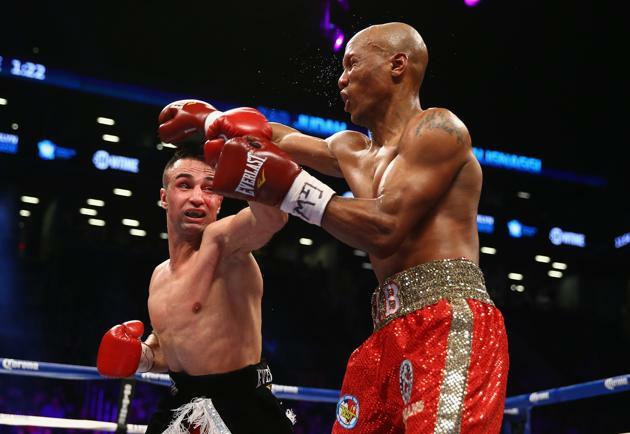 Moments ago, at the Barclays Center in Brooklyn, New York, two-division world champion Paulie Malignaggi won bragging rights in New York, defeating fellow Brooklyn native and two-division world champion Zab Judah via unanimous decision. It looked like an easy night of work for Malignaggi, who dominated Judah over the course of 12 rounds behind a crisp jab and a consistent body attack. Judah never really looked like he was in the fight. Relive all the action in FightHype's round-by-round results. Malignaggi comes out firing his jab. Right hand gets in for Malignaggi. Judah lands his jab. Left lands for Malignaggi. Paulie fires a right to the body. Zab lands his jab. Another right ot the body lands for Paulie. Another. Right upstairs lands for Malignaggi. Stiff jab lands for Judah. Another right to the body lands for Paulie. They trade jabs. Malinaggi backing Judah up. HARD right lands for Paulie. Round to Malignaggi. Quick left hand lands for Judah and Malignaggi slips off balance. His glove touches the canvas and it's ruled a knockdown. Nice left upstairs and a right to the body lands for Paulie. Another right to the body lands for Paulie. They trade rights. Judah lands a right, but he eats a left from Paulie. Right hand lands for Malignaggi. Another right to the body landsfor Malignaggi. Stiff jab lands for Paulie. Hook lands for Malignaggi. Other than that slip/knockdown, Judah didn't really do much in that round, so I give it to him, but I think Paulie did enough to make up for the lost point on the knockdown. Paulie continues to press forward. A break in the action after a clash of heads. Right hand lands for Malignaggi. Stiff jab lands for Paulie. Right to the body lands for Malignaggi. Judah answers with a body shot of his own. Left hook lands for Malignaggi. Straight left lands for Judah. Paulie digs to the body. Roudn to Malignaggi. They trade jabs. Malignaggi works the body. Judah lands a jab. Left hook lands for Malignaggi. Malignaggi continues to press forward behind his jab. Judah needs to let his hands go or he's gonna get outworked. Jab lands for Judah. Malignaggi gets in a nice uppercut. Left hand lands for Malignaggi. Round to Malignaggi. Triple jab and a right to the body lands for Malignaggi. Right to the body lands for Malignaggi. Judah backs up to the ropes. Left and a right lands for Paulie. Judah gets in a nice body shot. Left hand lands for Malignaggi. Right hand lands for Paulie. Judah gets in a jab. 1-2 lands for Malignaggi. Judah lands another jab. Malignaggi answers with his own jab. Quick combo from Malignaggi. Round to Malignaggi. They trade jabs. Straight right lands for Malignaggi. Jab lands for Malignaggi. Malignaggi continues to back Judah up. Nice 1-2 lands for Malignaggi. Jab upstairs and downstairs lands for Malignaggi. Right hand lands for Malignaggi. Judah gets in a jab, but he eats a jab from Malignaggi. Quick combo getrs in for Malignaggi. Triple jab lands for Malignaggi. Round to Malignaggi. Quick 1-2 gets in for Judah. They trade jabs. Now Judah explodes on him and lands a few shots. A break in the action as the ref warns both fighters for roughhousing. Right hand lands for Judah. Malignaggi lands a right. Jab lands for Malignaggi. Right to the body lands for Malignaggi. Jab lands for Malignaggi. Judah's eye is bothering him. Judah gets in a left. Malignaggi frustrating Judah. Right to the body lands for Malignaggi. Judah gets in some body shots. Round to Malignaggi. Paulie continues to pick Judah apart with his jab and his body shots. Nice 1-2 to the body lands for Malignaggi. Again. Stif jab lands for Malignaggi. Another. Right hand lands for Malignaggi. 1-2 lands for Malignaggi. Right hook lands for Malignaggi. Judah lands a counter left. Right hand lands for Malignaggi. Nice combo lands for Malignaggi. Round to Malignaggi. Nice 1-2 from Malignaggi snaps the head back of Judah. Nice right lands for Malignaggi. Jab lands for Malignaggi. Another. And another. They trade jabs to the body. Nice combination lands for Malignaggi again. They trade jabs. 1-2 lands for Malignaggi. Judah lands a left. Round to Malignaggi. Stiff jab lands for Malignaggi. Right to the body lands for Malignaggi. They trade jabs. Some boos from the crowd. Malignaggi continues to pepper Judah with jabs. Judah not really offering anything in return; he looks content to just go the distance. Malignaggi lands some rights to the body followed by a right upstairs. Round to Malignaggi. Judah gets in a straight left. Another left lands for Judah. Stiff jab lands for Malignaggi. Malignaggi digs to the body. Another jab and a right to the body lands for Malignaggi. Judah just not offering anything in return. Judah gets in an uppercut. Right to the body lands for Malignaggi. Round to Malignaggi. Right hand lands for Judah. Malignaggi lands a jab. 1-2 lands for Malignaggi. Nice combo lands for Malignaggi. They trade jabs. Malignaggi continues to pepper him with jabs. Left hook lands for Paulie. Right hand lands for Malignaggi. Judah tries to flurry at the end, but too little, too late. Round to Malignaggi.